Preheat broiler. Place poblano peppers on a baking sheet and broil until blackened, turning as needed, about 8-10 minutes. Remove from boiler, cover with a kitchen towel and allow to steam for 3 minutes. Remove blackened skin, stem and seeds; chop. To a Dutch oven, add oil over medium high heat. Add onions and sauté for 4 minutes until translucent, but not mushy. Add garlic, poblano peppers, salt, pepper and cumin and continue to sauté an additional 2 minutes. Add broth, hominy, and chicken to pan. Cover and bring to a boil, then reduce heat and simmer to blend flavors, 10 minutes. Ladle into bowls; top with garnishes. Aside from poblanos, Anaheim or any green chili pepper would be great in this soup. Pozole is a classic Mexican stew always present at home. When the temperatures drop, a bowl of pozole wraps you in a blanket of comfort. 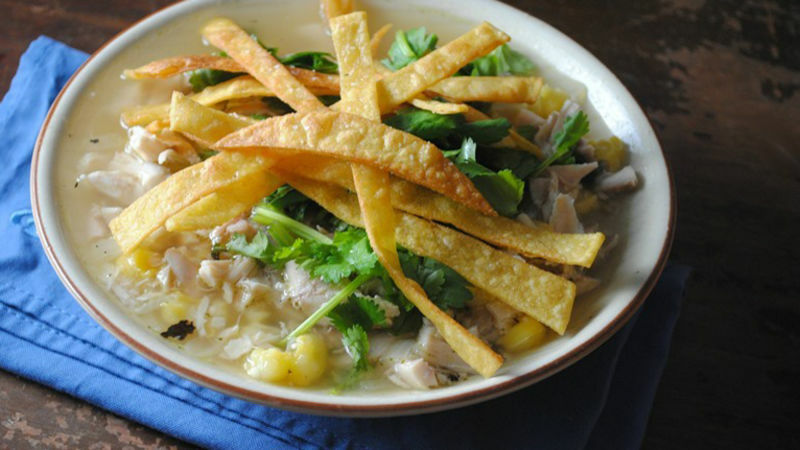 Steaming ladles of a rich broth, fork tender meat and succulent hominy garnished with crispy tortilla chips and lime wedges have the entire family running to the dinner table. My family enjoys it so much they request is every week; trouble is pozole can be a labor of love: A few hours are required just to simmer the chicken to create that rich broth. I love my family, but mommy has learned to take a few shortcuts. A roasted chicken from the deli counter at my local grocery store and pre-made chicken broth take this labor of love soup to a weekly under-30 minute meal.